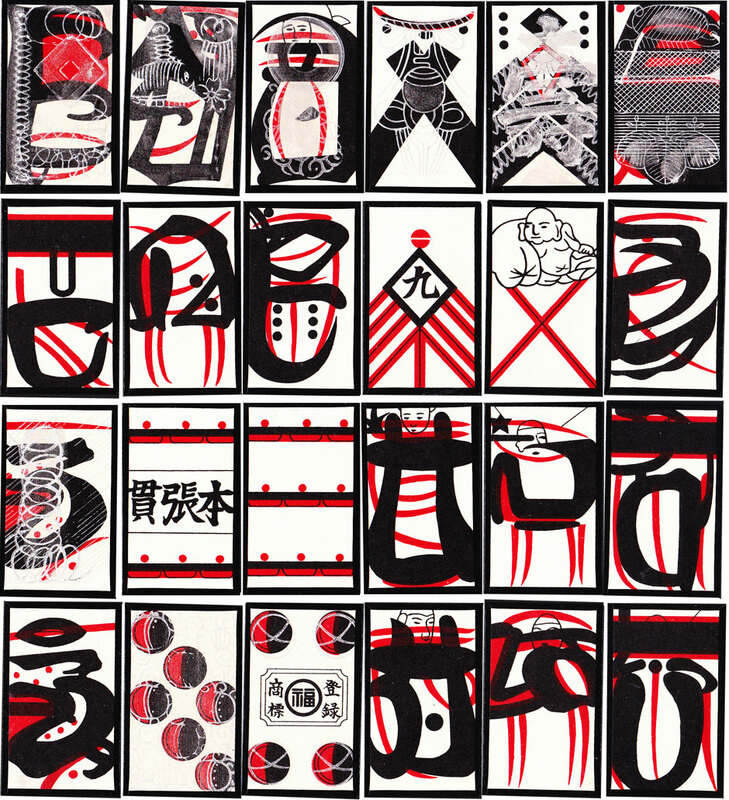 Although modelled on Portuguese cards taken into the country during the mid 16th century, these images give an idea of the general incomprehensibility of Japanese Mekuri cards. The court cards have become abstract forms with almost no visible indication of what suit they belong to. The idea was to disguise their appearance after Mekuri games such as Unsun Karuta and Tenshô Karuta were banned by the authorities, especially if played with foreign cards. 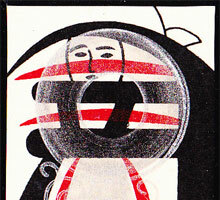 However, on some cards, one can see printed outlines peeping through the masses of paint, forming faces, etc. The famous dragons (Aces) are now only vague shapes of paint, having lost all connection with their original models. Another feature is the silver overprints on some of the cards, perhaps to make them more visible in dimly lit rooms: note the 6 of batons in particular, which has 壽 (longevity) on it. Images and notes courtesy Anthony Lee (visit his blog →). Above: top row (batons): King, Knight, Knave, 2, 6, Ace. Second row (swords): King, Knight, Knave, 9, 2, Ace. The 2 of Swords has a Buddha. Third row (cups): Ace, 6, 9, Knave, Knight, King. The Knight preserves the vague form of a man astride a horse; four legs support the abstract figure. 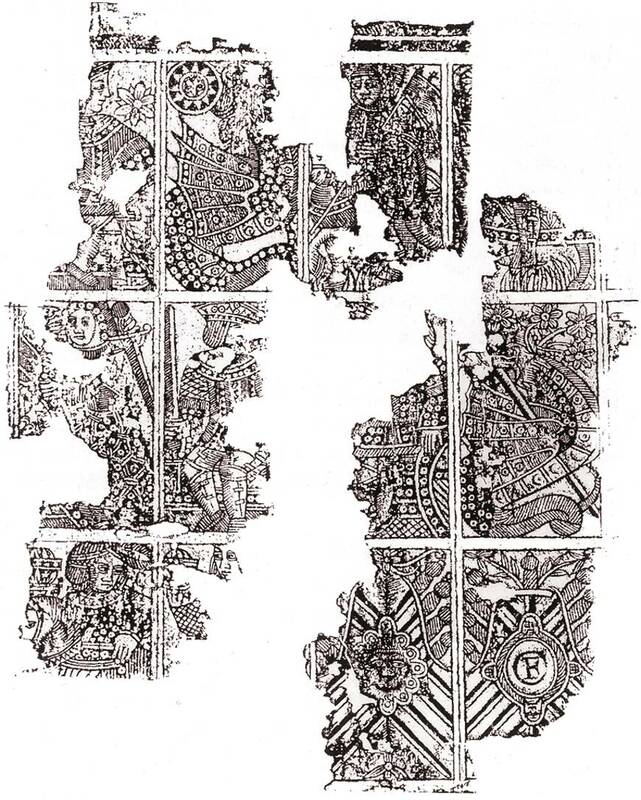 Fourth row (Coins) Ace, 6, 4, Knave, Knight, King. It is debatable whether the Ace retains any resemblance to a dragon. Images and notes courtesy Anthony Lee (visit his blog). 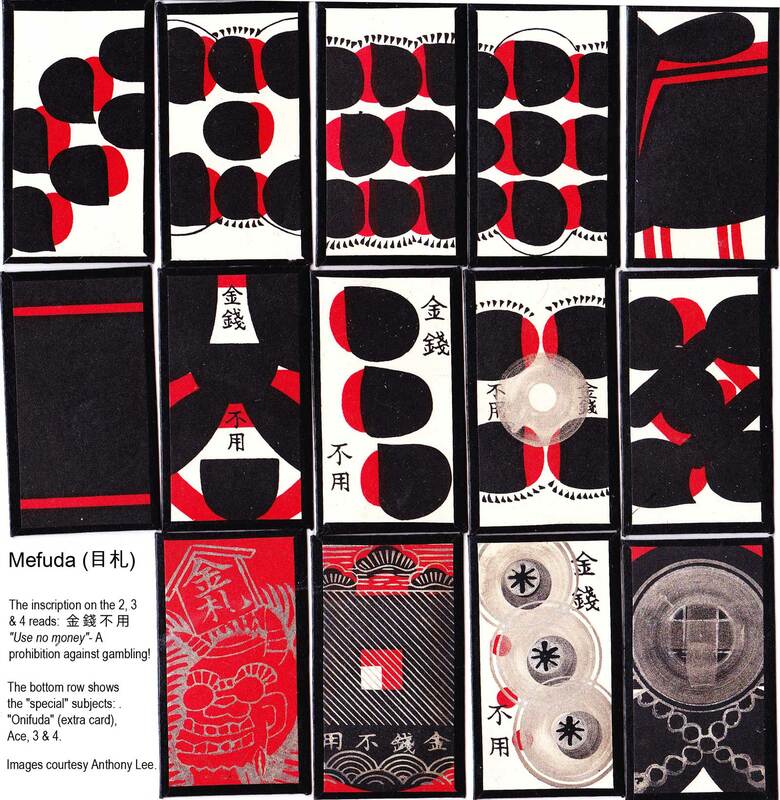 • See also: Kabufuda • Kurofuda • Mefuda • Japanese Flower cards.